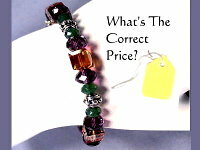 Click the button below to add the PRICING AND SELLING YOUR JEWELRY CLASS (class fee) to your wish list. How to price and sell your jewelry is a course designed to teach people how to realistically appraise their costs and how to fairly price their jewelry for resale. Attention is paid to how various costs -- materials, labor and overhead -- are calculated. A formula is provided which inter-relates these costs in order to calculate a price. Some discussion is presented about the differences in pricing strategy among retail-home studio, retail-store, wholesale, and consignment. In addition, the student is introducted to each stage of a comprehensive marketing strategy. Discussed are ways to introduce marketing into the student's own planning and selling processes. Understand what kinds of design changes must be made, if a price is deemed either too low or too high. This class is typically offered once a year. However, it is available as an online video tutorial all the time.